NI Premium Brands Aktuellt Nyheter från NI Premium Brands What's new in P5 version 5.6? 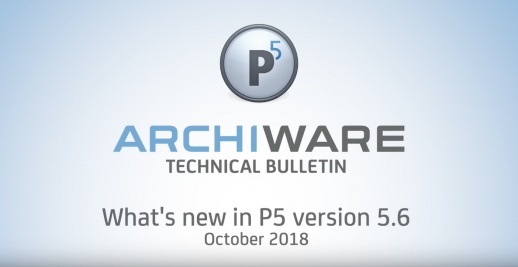 As announced at IBC 2018, Archiware P5 version 5.6 was released on October 4th and is now available for download on our website. It is packed with exciting new features, including native LTFS support, an extended list of compatible cloud services (Backblaze B2, Wasabi S3, Hitachi S3 & Microsoft Azure), support for cloud import services, plus a range of new functions for P5 Synchronize. Get an overview of the new features on our website or watch the video below to see how they work in detail. As always, P5 version 5.6 is free for customers with a valid Software Maintenance Agreement. With the release of version 5.6, Archiware is introducing the new P5 Desktop Edition, an essential license package including P5 Archive and P5 Backup to a single LTO drive. The P5 Desktop Edition is intended to make P5’s high-end data security and broad feature set affordable for single users and small groups. At a price of just EUR 1,000 (GBP 1,000/USD 1,400/JPY 115,000), it offers amazing savings compared to the list price of the modules included. See the P5 Desktop Edition flyer for more details!